If you upgrade a project with the old style railings in it, they are not converted to the new style railings, so you cannot use railing supports in them. To achieve this, you have to copy a new railing type into your project, then swap the old family type to a new one to get access to the support functionality. The metric project templates provided by Autodesk do not include any railings that use handrail supports (this includes the Australian and UK templates); they do have some support families - but if you don't know how to use them, you'll never figure it out by playing around with the railing samples. The sample files that you can download from the Autodesk Knowledge website include only the old method of using balusters to look like handrail supports - and that is the imperial unit sample file, which you would expect to be the most likely one to be updated when the software was changed (The metric version would have no chance, even if you could find it on the Autodesk labyrinth-site). I wonder if anyone at Autodesk knows what QA means? 'Quality Assurance' is the correct answer, not 'Quick As (get this out the door)'. The settings for adding supports are buried deep as type properties of a nested family. The chances of finding this are slim - although that has improved recently with the ability to get to a handrail family properties directly from the railing type properties dialog box with one mouse click. The methodology for setting up handrail supports is mind-bogglingly complicated and counter-intuitive - and it is all type-based properties hidden inside handrail families nested into the railing family. Even when you have set up the supports in a handrail family, you have to remember to choose left or right (for the handrail) in the railing family, otherwise nothing shows up. 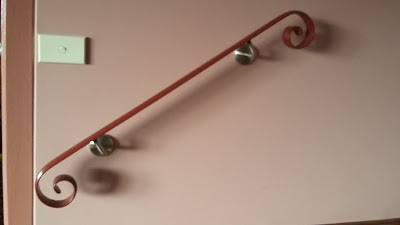 Do you think it is weird that baluster spacing and handrail/top rail extension length properties are measured in plan distance regardless of the slope of the railings, while support spacing is measured along the actual length of the handrail whether it is horizontal, sloping, vertical or going round a twirly flourish at the end? Whichever one is correct, it is weirdly inconsistent. How would you measure the support distances on this handrail? 1. 'Fixed Number' does not put supports at the ends of the railing; the spacing varies depending on the overall railing length, and the number that you put in - NB. the number is a type property of the handrail, which means that you most likely need a unique handrail type and a unique railing type for every single instance of the railing. It seems that the supports always use centre justification for this - it is greyed out and you can't change it; also, the greyed out value for spacing is just a remembered value from the previous settings, and is misleading here. Revit does not report back to you what the actual support spacing is on each handrail instance. If you have a free end handrail, you would typically want a support close to the end (but not exactly at the end). You don't get a support anywhere near the end, unless you put in a ridiculous number of supports, like 50 in this example. If you have an extension to wall or floor, then this option makes sense, however, the spacing includes the length of the extension, measured along the handrail, including vertical length for a floor extension. The example below, with a wall extension is the one and only situation where Revit gets the support locations close to what you might need, albeit that you need a separate type for each different number of supports. 2. 'Fixed Distance' only puts a support at the start or end of the handrail if the justification is set to Beginning or End; the distance at the other end is pot-luck depending on the overall handrail length. If the justification is 'Center', then the distance from the start and end again depends totally on the overall length of the handrail - so it is luck of the draw, but it will be the same at each end. The calculated distance includes extensions. 3. 'Maximum Spacing' always puts a support exactly at the start and end of the handrail; justification is not an option here - it is greyed out (and set to center). Just imagine sending this drawing to a builder or fabricator - you'd be laughed off the site. Revit does not take into account whether an extension with a wall or floor fixing is chosen - it still puts a support in place at the very end, just where it is fixed to the wall/floor. 4. 'Minimum Spacing' behaves just like the Maximum Spacing settings, although the actual spacing will be different. 5. 'Align with Posts' is an interesting option - I don't get why you would use it, unless your posts are non-supporting in themselves. If you do use it, you have no option for supports between the posts, so what good is that? I would have thought the option should be 'Align with Posts & Maximum Spacing Between' and suchlike. Or 'Maximum Spacing Except at Posts' etc. With all of these options, you have the opportunity to unpin a support and move or delete it; [Edit - thanks to Peter Schiettecatte for pointing this out:] but you can only add additional supports by unpinning an existing one and copying it along the handrail (a clever but not too obvious workflow). However, once you have done this, it takes just one innocent (or stupid) click on the 'Reset Railings' button to lose all that hard-won support over-ride spacing. If you think this is a good idea, please go to the official Revit Ideas website and vote up my idea on this. what can I say, you're right all the way. "With all of these options, you have the opportunity to unpin a support and move or delete it; but you cannot add additional supports." If I remember correctly, you can copy a support with the copy command. It will still follow the path. Peter - you are quite correct, you can copy unpinned supports. I will edit the post accordingly. We still keep learning about Revit's secrets.